He is the number 1 ranked ODI batsman in the world and the number 2 ranked test batsman in the world. Besides compatriot Hashim Amla, he is the only batsman in the world to average above 50 in both ODIs and Tests. And Adam Gilchrist recently said he is the most valuable cricketer in the world. AB De Villiers is a complete freakshow! What AB De Villiers did yesterday was purely phenomenal. To come out to bat in the 39th over of an ODI and out score someone who batted for the entire 50 overs is just out of this world. No one in this world has come out to bat after the 30th over of an ODI innings and score a century. AB De Villiers has now done that twice! There is absolutely no comparison to AB's level; yet I am still going to sin a little bit and compare the only three ODI centuries that have been scored in less than 40 deliveries. There is no doubt that AB's record century yesterday was special. It wasn't special because he scored the fastest ton in ODI history; it was special because of the kind of shots he played and the fact that he racked up 149 off only 44 deliveries. AB walked out to bat in the 39th over and got out in the 50th; Hashim Amla batted for the entire 50 overs and scored just 4 more runs than AB did... one can't even dream of playing such innings; think about actually doing it. Corey Anderson's innings was special in its own way. The match had been reduced to 21 overs a side and Jesse Ryder, who had opened the innings for New Zealand, was already smashing the West Indians around. Anderson walked in and took the attack to another level. His innings was special because he broke a record that had stood the test of time for 18 long years! Imagine what Shahid Afridi must be thinking. He played international cricket for 19 years, held a world record for 18 of those years, and then saw it broken twice in his final year of ODI cricket. 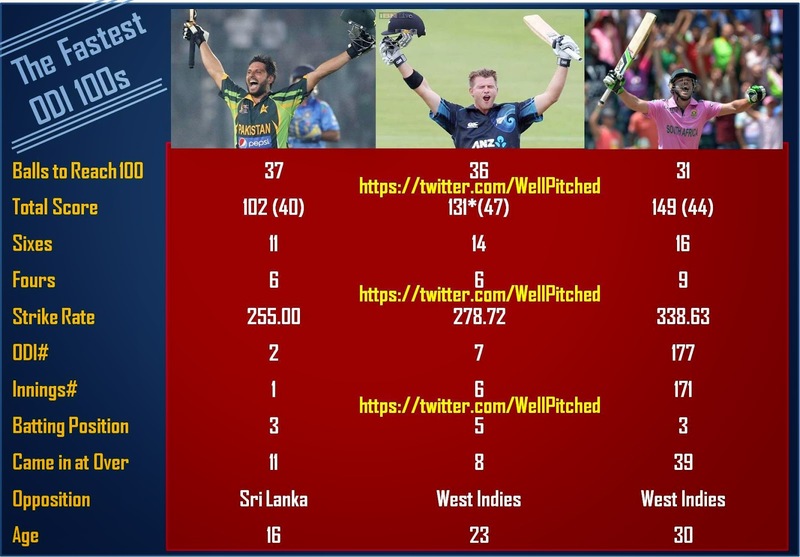 Afridi's innings, despite being the slowest of the three centuries, was special because it was the first ever ODI hundred scored in less than 40 deliveries. But what was even more extraordinary about Afridi's century was the fact that it was his first ever innings in an international cricket match. He was in the team as a mere leg spinner and overnight shot to fame because of one of the most brutal attacks to be ever witnessed in ODIs. Arguably, Afridi also faced a tougher bowling attack than the one faced by Anderson and AB. Think Chaminda Vaas, Muralitharan, and Dharmasena. And he also had to deal with 5 fielders on the boundary, as compared to only 4 fielders in today's times that Anderson and AB had to deal with. It could also be argued that Afridi came in to bat in the 11th over the innings and was under significantly more pressure than Anderson and AB were when they came out to bat. Anderson was in the middle of an ODI that had been reduced to a 21 over hitathon. While AB walked out in the 39th over with South Africa cruising at 247-1. They both had the license to destroy the bowling without worrying about losing their wicket. Both Anderson and AB had to sustain the momentum that had been built by the batsmen before them; Afridi, on the other hand, had to start building the momentum that Pakistan desperately required in order to qualify for the final of the quadrangular tournament. Pakistan not only had to win the game against Sri Lanka, they had to do it with a significant margin in order to qualify for the final. It was a pressure game. For Afridi to do it in these circumstances in his first ever international innings was truly special. Even though all three fastest centuries are special in their own way, AB De Villiers innings is the best of all in my opinion for its sheer brutality and entertainment. I have never seen anyone demolish a bowling attack the way AB did yesterday. It was quite unbelievable. I really do think that AB played the best ever ODI innings ever to be played in the history of ODIs. Afridi's record stood for 18 years; AB's might never be broken. No if, no but, AB marvelous century is definitely on the top. There are very few players as versatile as AB and he shoes it every time he is on the field – whether batting, fielding or keeping the wickets.